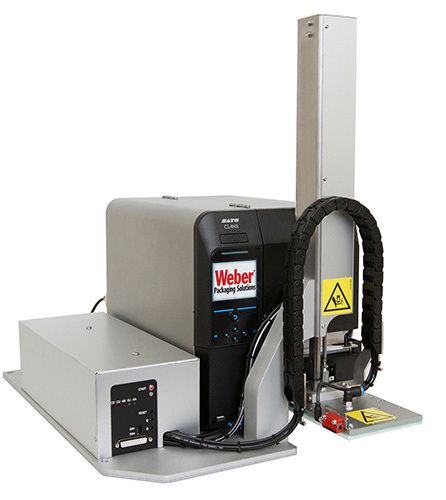 When you are looking for a low-cost yet high-performance automated print and apply system, look to Weber’s LA-2050 labeling system. This robust system offers maximum performance in a small compact footprint using a highly-efficient low-energy tamp-blow applicator for contactless labeling. Labeling accuracy is ±0.05 inches. The LA-2050 is perfect for small ecommerce fulfillment companies or anyone needing to automate their labeling for the first time. 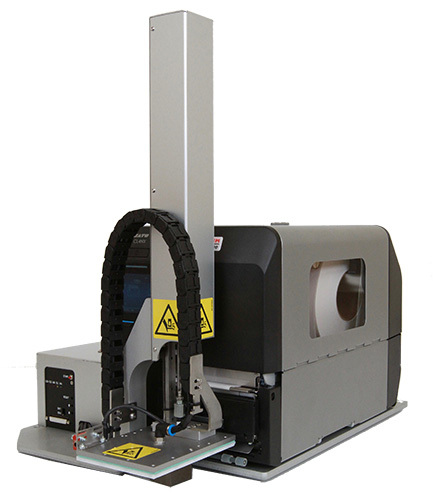 Using a Sato CLNX label printer, the LA-2050 takes the printed label and applies it to a product moving on a conveyor line or on a one-at-a-time jig fixture. Featuring a variable stroke tamp and sensor, the LA-2050 provides automatic labeling for products of different heights. Able to apply up to 25 labels per minute, the system can be used as part of an automated production line or as a stand-alone unit in a jig fixture for accurate labeling. The LA-2050 uses a 300-dpi Sato CLNX thermal-transfer label printer that can print thermal-transfer or direct thermal labels as small as 1.1” x 1.5” up to 4.7” x 6.2” (ideal for 4”x 6” shipping labels). The printer uses a 8” label roll and up to 1968-foot ribbons for longer continuous operation between changes. The printer works with many programming languages such as ZPL, DPL, IPL, and TPL without having to change any settings. Print jobs are sent to the Sato printer which then feeds the printed labels to the LA-2050 for application. The system is easy to operate and can quickly integrate into your current production line. Data interfaces include USB, LAN, Bluetooth and IEEE1284. The LA-2050 variable-height tamp-blow print-apply system includes a number of noteworthy features that add to the operational versatility of this printer-applicator. • Tamp-blow application. This is a very popular method of air-assisted label placement used with standard applications, and is particularly useful in the labeling of recessed areas. A printed label is fed onto a tamp pad and held by vacuum, a servo-powered cylinder extends to within .25 inch of the product, and the label is blown onto its surface to a placement accuracy of 0.05". Up to 40 labels per minute; dispensing output depends on label size, text and dispensing stroke. Position accuracy of the dispensed labels: Standard: up to ± 0.05” (1.5mm) with controlled product handling.